One of the best ways to judge the strength and maturity of an asset management product is to examine its reporting capabilities. Software Asset Management is inherently data rich. Without appropriate reporting, even the most accurate data is just more data. 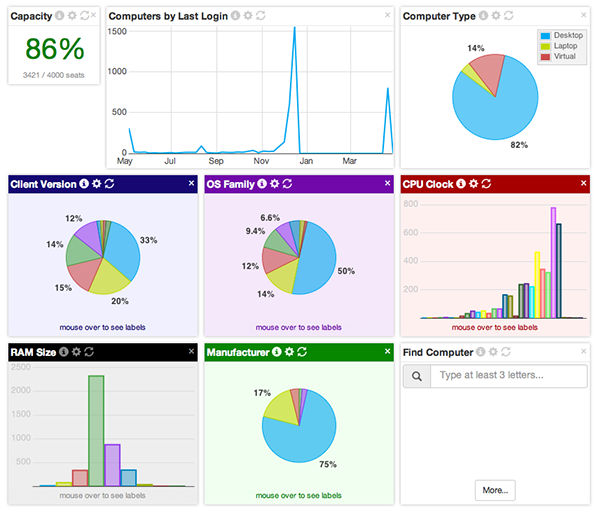 K2 quickly communicates key metrics in customizable dashboards available right in your browser. Widgets link to more detailed reports, which can be parameterized and filtered to extract exactly the information you need. Your dashboard communicates maximum information in minimal time. All too often, web UI for enterprise applications means 100 pages that are distinct yet look identical. Nondescript forms that could have been built 20 years ago, requiring 10 clicks to accomplish one simple task. Instead, we’ve built a modern, responsive, clean, and fully customizable UI that you will actually want to use. Available widgets go beyond mere summarization, offering analytics and intelligence. K2 provides several optimization reports to help your organization reduce costs for both software and hardware. Two examples are shown here. 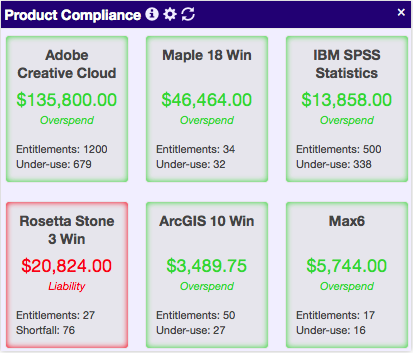 The Purchasing Dashboard compares purchased entitlements with software deployment and utilization to show where you have spent too much on licensing and can cut back on the next purchase, and where you have over-deployed unlicensed software and either need to uninstall or purchase more to cover demand. 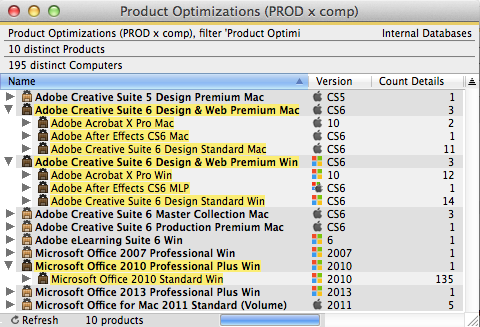 The Product Optimizations report analyses software program usage within product suites and it shows which computers can actually be licensed for a less expensive product now or in the future. 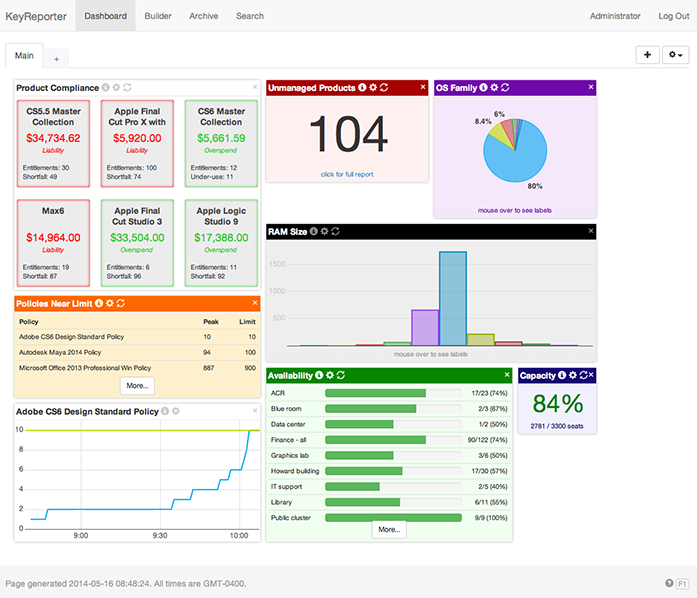 The publicly visible dashboard can also be customized. By default, guests can only view computer availability within divisions where a map has been configured. The dashboard contains only the Availability widget (as in the first screenshot above), and clicking on a division reveals the map for that division. Maps can be configured entirely in the browser using drag and drop shapes – or they can include a custom background image. You can change the guest dashboard to expose more data without requiring a login. Customize which widgets are displayed, what type of data can be viewed, or even which specific data objects are publicly visible. All of this extensibility that applies to guests can also be applied to individual Administrators on a per-login basis. After all, the purpose of a dashboard is to make the right data available to each person in an efficient way. K2’s enterprise scalable administrative Roles & Accounts lets you configure who can connect to the administrative and reporting consoles. Roles & Accounts gives you fine grain control over which administrative actions can be performed depending on the management “Role” assigned for each specific account. Reporting capabilities of an account can also be limited in “scope” – for example an account may be configured so that it can only see computers within a specific division. Administrative Roles can be assigned globally to IT staff throughout your organization. While dashboard data gives broad summarization, you can always drill down to more detailed, specialized data. K2’s built-in, customizable report templates produce hundreds of different reports directly from either a web browser, or its devoted management console. You’ll find an extensive collection of audit, usage, compliance, and optimization reports, plus charting reports such as histograms, and daily and weekly usage analytics. 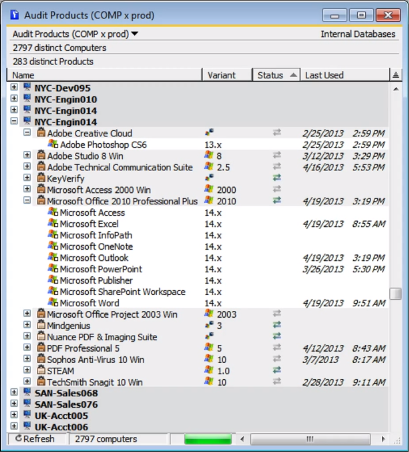 You can choose reports for individual computers, software products, license management policies, groups of computers, products, or policies, or your entire software/hardware ecosystem. 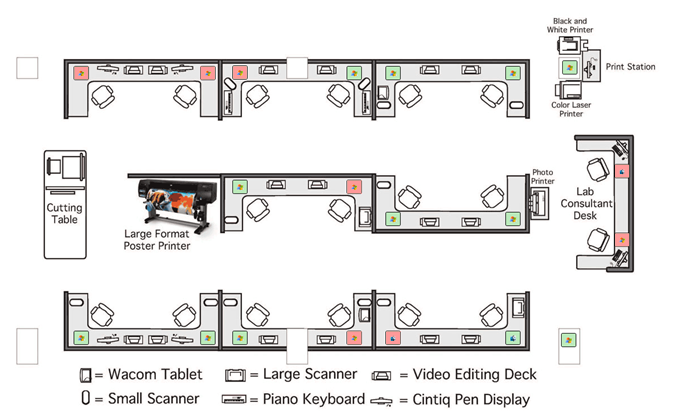 You can easily group physical and virtual computers to match your organizational structure, and then run division reports to view extensive division level details in all reporting categories. We love K2 KeyServer. The way we are able to manipulate data to discover usage patterns is awesome. The integration of reporting capabilities in the management console is pervasive. Every part of K2’s configuration console can be used to produce detailed or summary reports about software deployment, hardware inventory, utilization, license entitlements, even diagnostics for troubleshooting. Click on a list window to run reports for all items in the window, click on an item to run reports for that single entity, click on Divisions or Filters or folders to run reports for the items in them. Then select a line in the resulting report and click to run other reports relevant to the selected line. Every summary report has drill-down capabilities. Internal reports include live links from each reported item directly to K2’s configuration console so you can instantly inspect and reconfigure management options when necessary. K2 does not require any back-end data services from the host OS or third-party processes. The tight integration with its self-contained data server provides for extremely easy deployment of a complete solution. But if your requirements include integration with existing IT operations tools, or you need custom reporting, K2 supports this integration through the following flexible, industry-standard interfaces. K2 data can be live-linked to external IT management, procurement and help-desk systems with flexibility limited only by your imagination. Data export is not required since K2 includes an ODBC driver that will funnel external SQL queries directly to the K2 database server. Industry standard reporting tools (e.g. Crystal Reports, Remedy, Microsoft Access, etc.) can be used to directly query live K2 data while also joining to other data sources. When a dedicated, high-end, sql database server is available, you may want to take advantage of its performance when querying large data sets. Also, custom reports that join to external data may be easier to optimize when all of the data sources are hosted on a single dbms. K2 can mirror its data onto an external database server such as Oracle, SQL Server, or any target accessible through an ODBC driver. Then K2’s built-in reports can simply be pointed to the external data source and they will continue to work from within the Admin console alongside any of your own custom external reports. Export to CMDB, Helpdesk Ticketing system, etc. Many K2 users rely on K2 to populate their computer asset data into their in-house CMDB, ticketing system, or other IT management tools. Some use common export/import processes while others live link their data to their ticketing system. The multiplicity of ways that K2’s management data can be viewed, exported, and integrated with other IT asset, procurement, and help-desk tools provides the necessary flexibility to support both your immediate goals and future requirements. 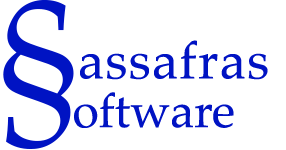 Sassafras is the best company that I have experienced for customer & technical support. Over the past year, I am instantly connected with a knowledgeable technician who is genuinely willing to work out any licensing problem. Usually when companies make a great product and grow in size as a result, customer support suffers. Not so with Sassafras. They focus on one product and support it perfectly. KeyServer is an amazing product but its support is even better.